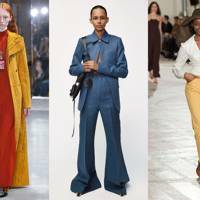 It is the first of the four big fashion weeks to do so. As if the prospect of London Fashion Week kicking off next week wasn't exciting enough, the British Fashion Council have today announced a landmark ban on real fur. 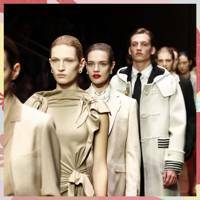 The first of the four fashion weeks to do so, the new rule will ensure than no designer on the official catwalk or presentation schedule will use fur. According to the announcement, the BFC's decision is in reaction to the "results of a survey" they carried out. 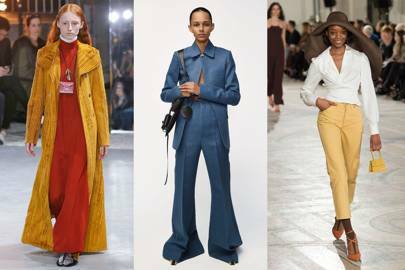 "The BFC supports the creativity of designers and keeps an open dialogue with the industry, from designers to media, retailers, business leaders, government and global brands while encouraging designers to make ethical choices when it comes to their selection of materials and supply chain." 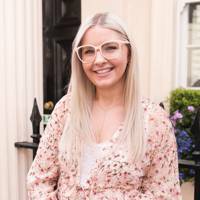 "The BFC survey results reflect a cultural change based on ideals and choices made by designer businesses, international brands as well as consumer sentiment but also encouraged by the stance of multi-brand stores who are moving away from selling fur." The news follows the much-anticipated announcement this week from Burberry that they would no longer use real fur, and will be phasing out existing fur items. Think Clueless but cooler. 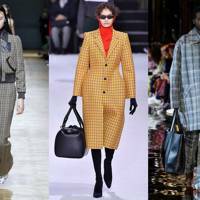 For autumn/winter 2018, the catwalks were awash with the geometrical print across every kind of item. And don't be afraid to double up - both Stella and Rochas showcased full two-piece outfits cut from the same cloth and the entire front row swooned. 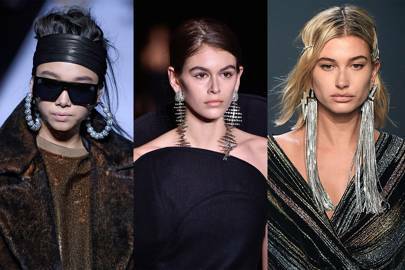 While last season's jewellery repertoire comprised of brightly-coloured pom-pom ear adornments, for AW18, things get a whole lot more extra. And - we hasten to add - a whole lot heavier. But you have a whole summer to gradually train your lobes with semi-heavy earrings in preparation for a winter full of this gloriousness. 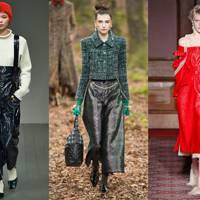 Trousers, heels, coats, jumpsuits, gloves... you name it, we want it glossy. 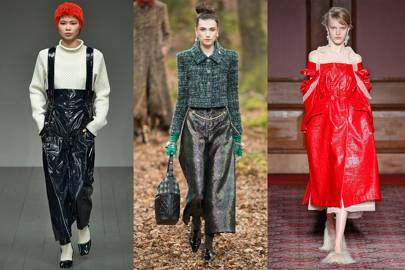 Lacquered fabrics are having a moment right now, and it's shinier than ever for next season. 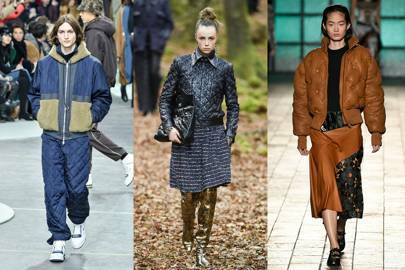 Paired with other tactile materials, such as a cable-knit sweatshirt, tweed jacket or faux fur shoe, they pack a serious punch. Such is the impact of a sequinned dress, Saint Laurent's Anthony Vaccarello dedicated an entire half of his AW18 collection to variations of the showstopper. 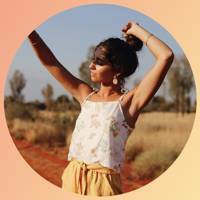 Whether you opt for a fun mini or full-length drama, make sure to keep your beauty look minimal so as not to venture into overkill territory. 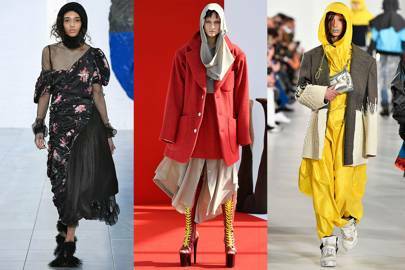 Hoods, hats, turbans and hijabs all appeared on a number of designer catwalks this season... to mixed response. 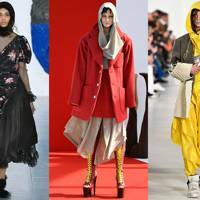 Some saw the use of the latter religious headwear to be tone-deaf cultural appropriation, while others celebrated it for increasing visibility of groups often underrepresented in mainstream fashion. 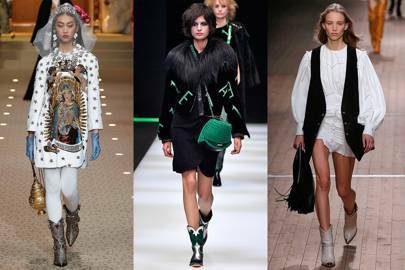 The humble cowboy boot was one of the biggest footwear trends to storm this month's catwalks. 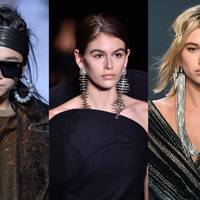 Reappearing in a number of different guises, we saw it bejewelled to the max at D&G (who else), while Isabel Marant's take was a whole lot simpler and more everyday. We'd suggest snapping one up from each end of the extra-spectrum to cover all bases. 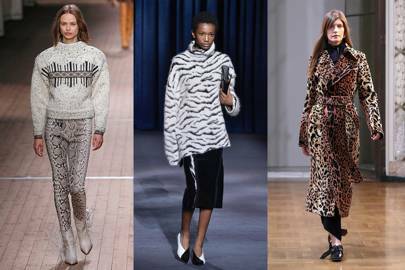 While it may not be a groundbreaking concept, animal print was noticeably popular across all four fashion weeks for AW18. 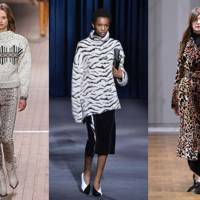 Whether it was Victoria Beckham's leopard-print trench coat, Givenchy's white tiger-print sweatshirt or Isabel Marant's snake-print trousers - we're here for it all. Perhaps together?! If you've been stuffing your tote full of spare jumpers, lip balms, receipts and unused notebooks (inspo could strike at any time, amirite? ), then it's time to cut the clutter. 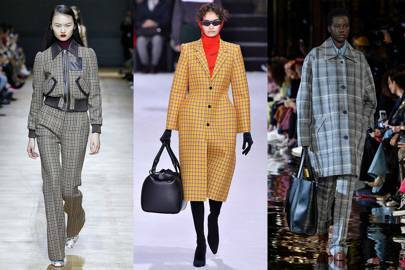 By Autumn/Winter 2018 you're allowed your credit card and perhaps one receipt - folded twice - because your new handbag will be the size of a minature purse. If that makes you break out in a cold sweat then look to Céline, who have come up with the answer via a rope belt trailing several mini bags off of it. 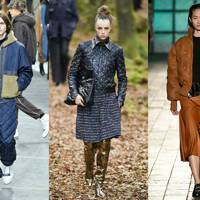 Cementing the suggestion that comfort is key, several big brands looked to quilting for their collections. After a month on the road - and on those painfully uncomfortable fashion show benches - the idea of padded troos à la Lacoste is a very appealing one right now. 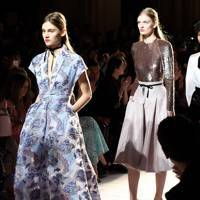 Thank you to for hosting GLAMOUR UK throughout Paris Fashion Week.